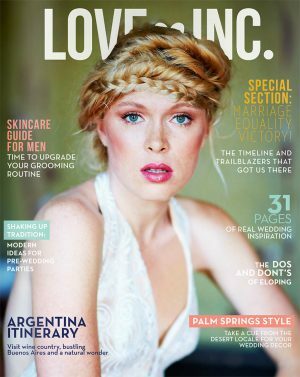 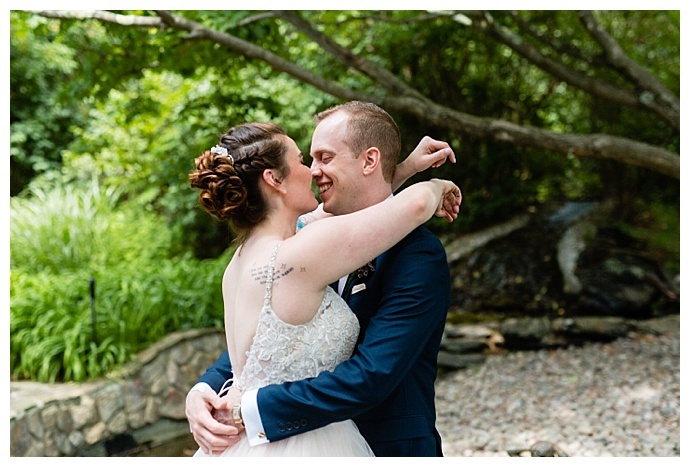 On this Valentine’s Day, we’re so excited to be sharing Susanna and Jacob’s Bohemian DIY wedding because theirs was a day that was palpably filled with love. 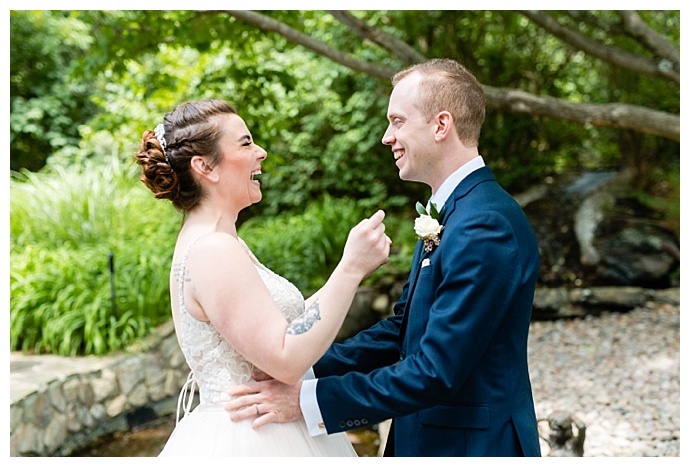 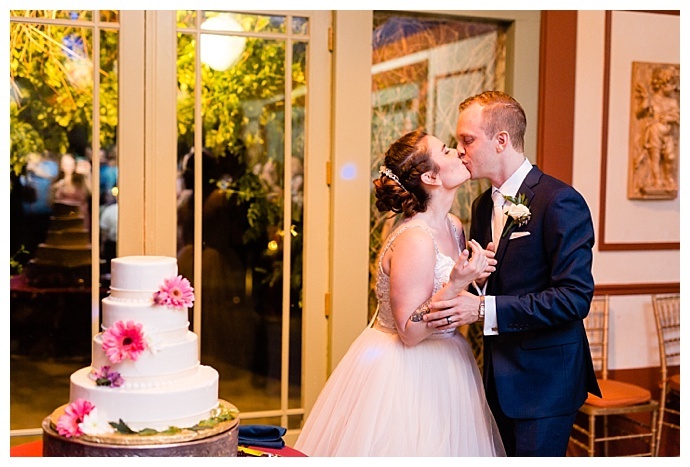 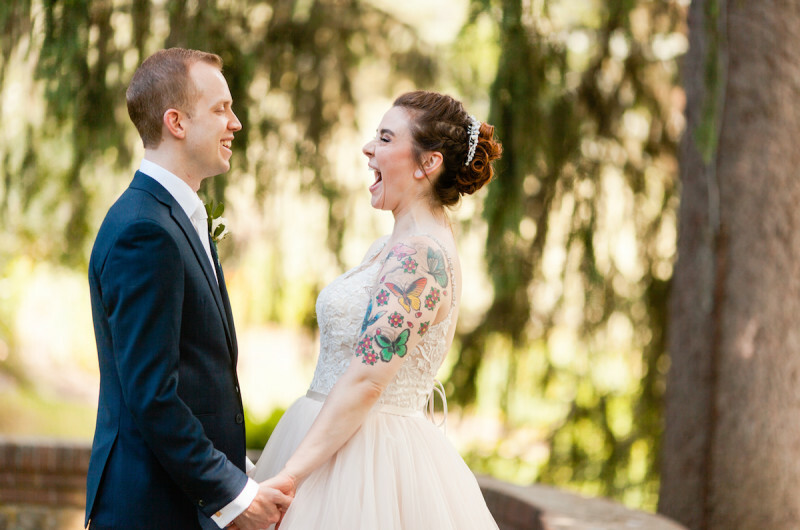 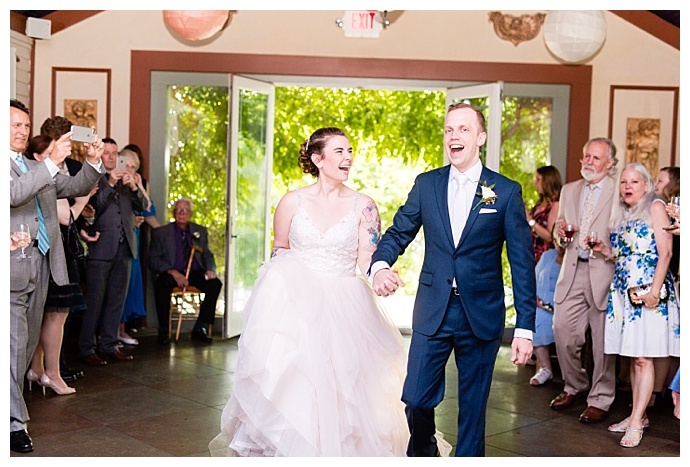 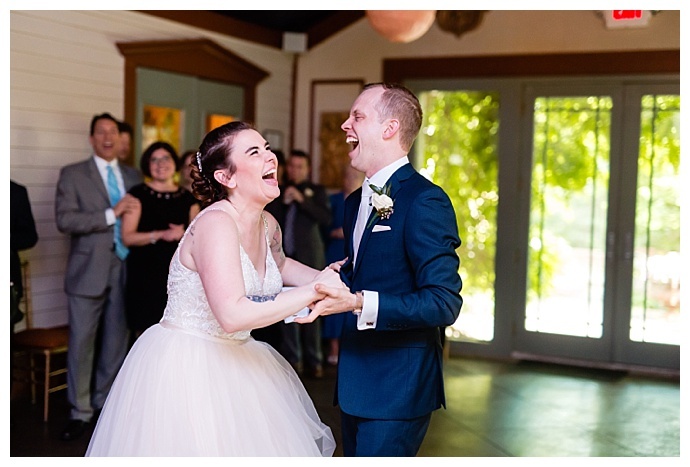 With wide, contagious smiles spread across their faces from the moment they got ready until they cut the cake, every moment captured by Casey Fatchett Photography is truly heartwarming. 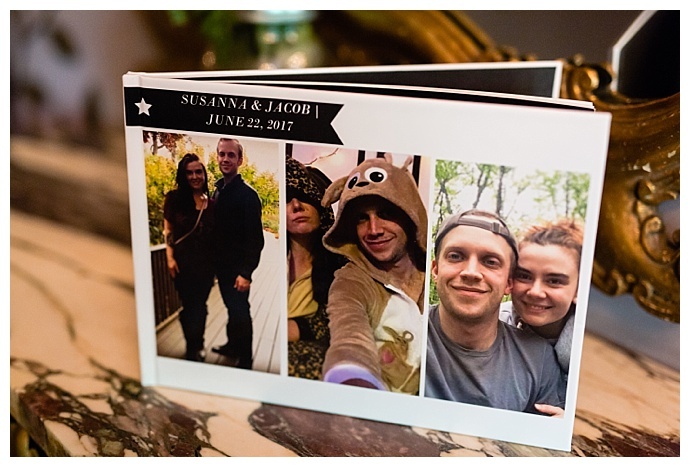 Friends often make the best matchmakers, and that couldn’t have been more true for Susanna and Jacob. 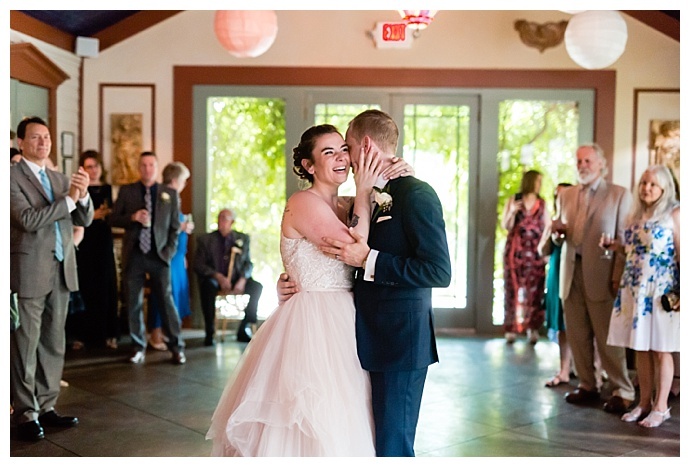 Their best friends from college at Cornish College of the Arts in Seattle were dating and introduced them. 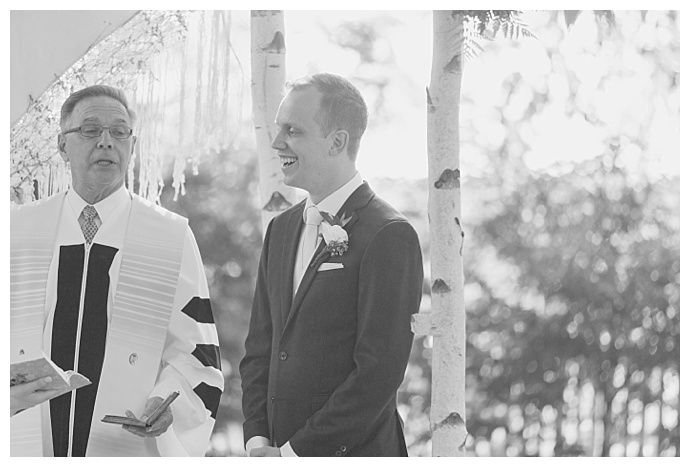 The spark was there, and the rest is history. 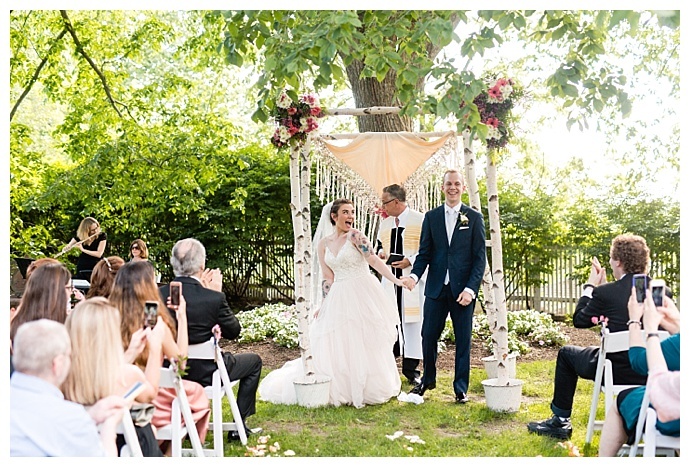 Years later, a boozy brunch with unlimited mimosas led to a proposal, and it wasn’t long before they were planning their wedding! 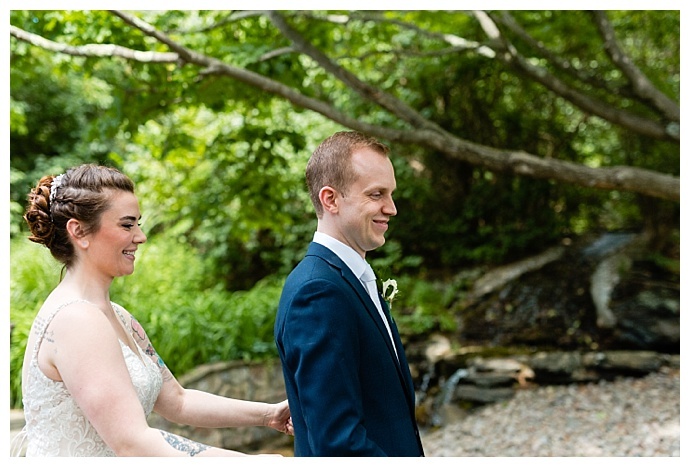 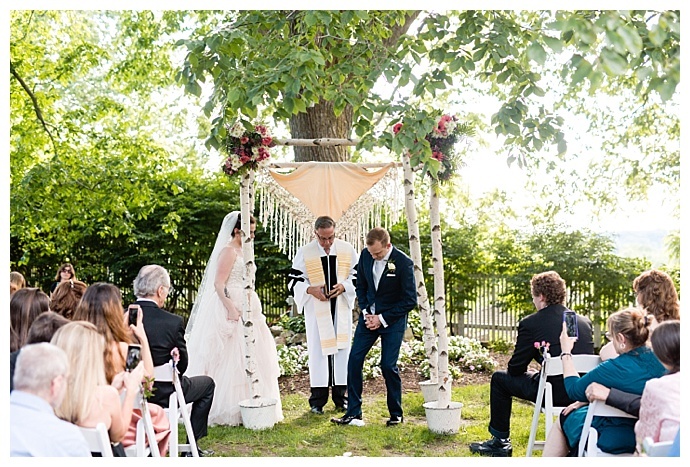 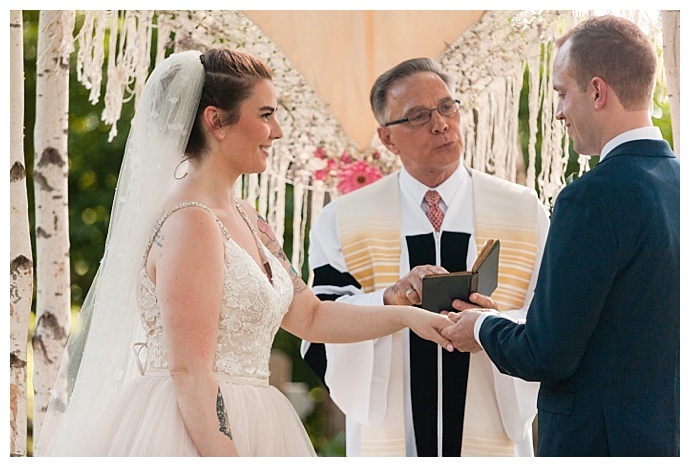 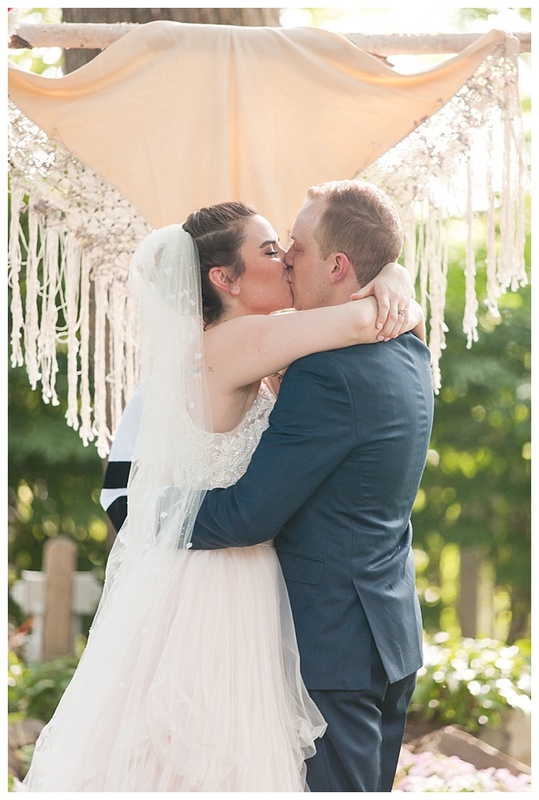 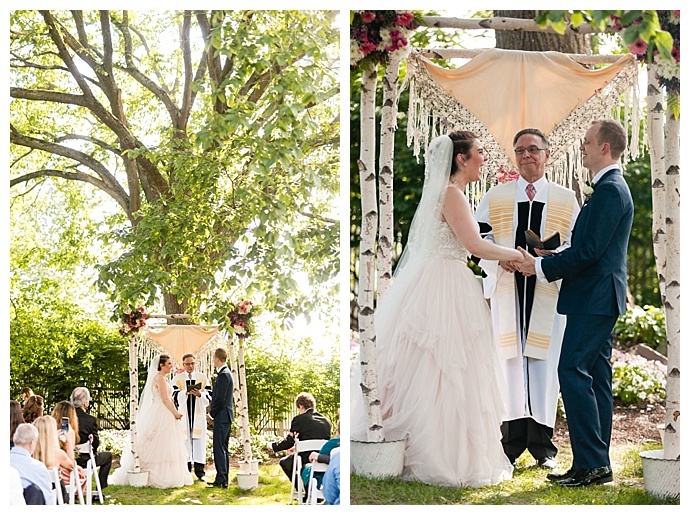 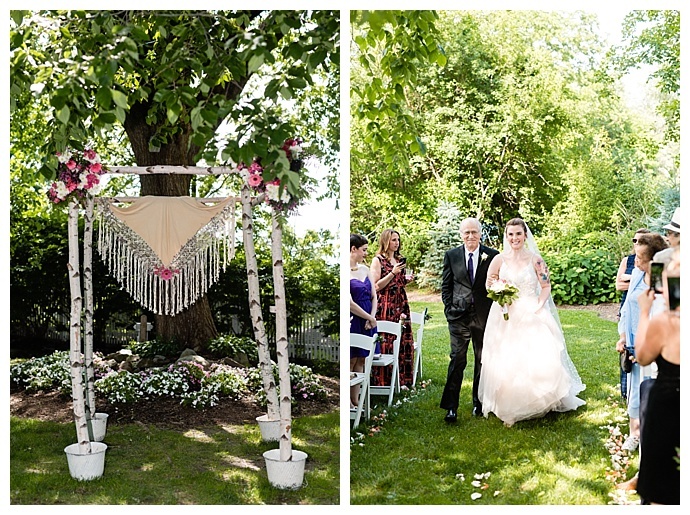 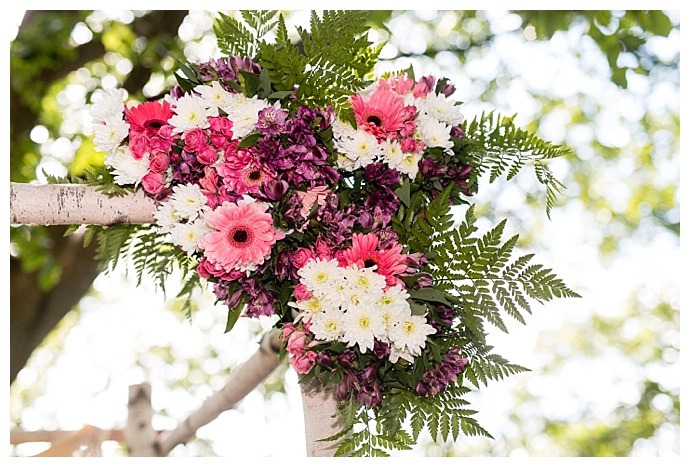 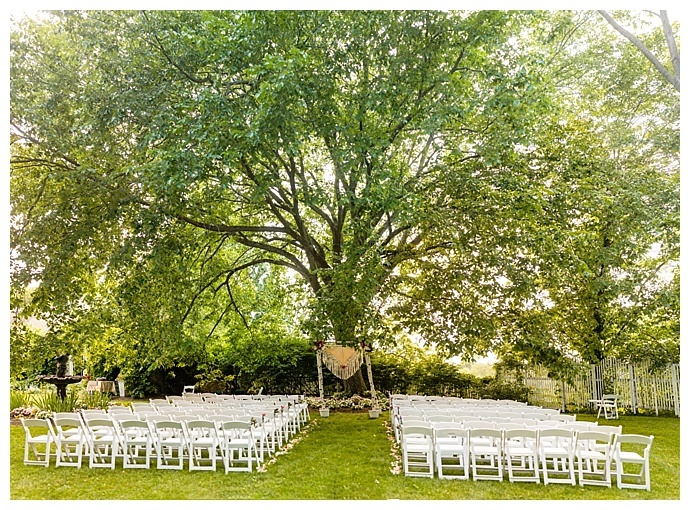 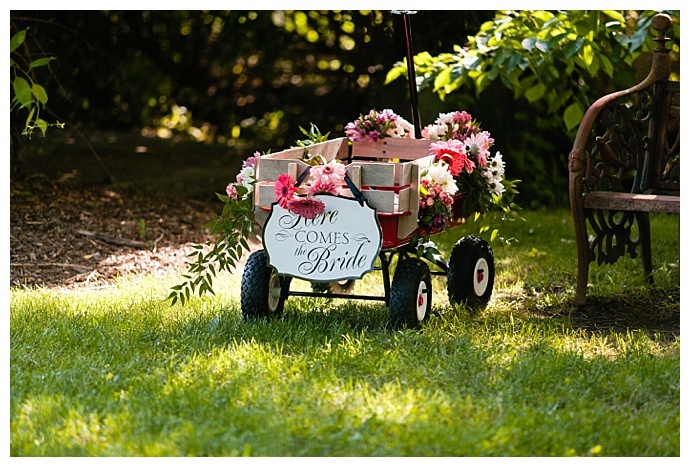 It was important to the bride and groom to be married outside, so underneath a birch wood chuppah decorated with vibrant flowers that was shaded by tall trees, Susanna and Jacob tied the knot in a cheery ceremony. 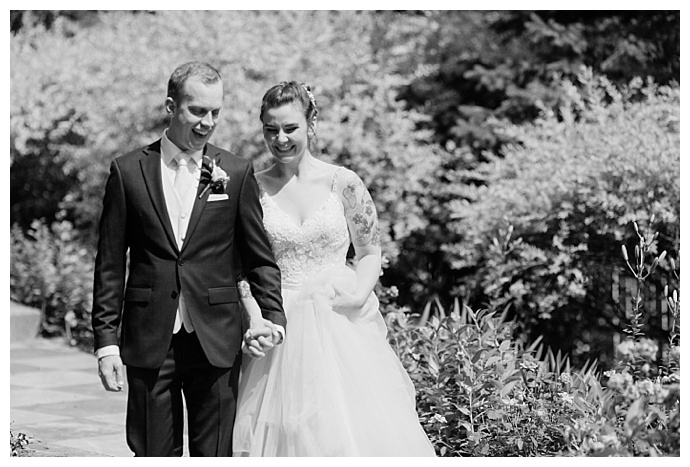 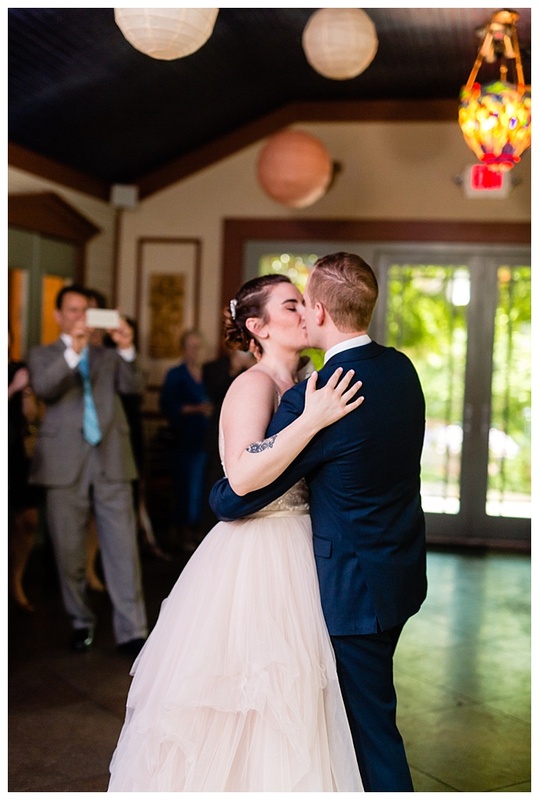 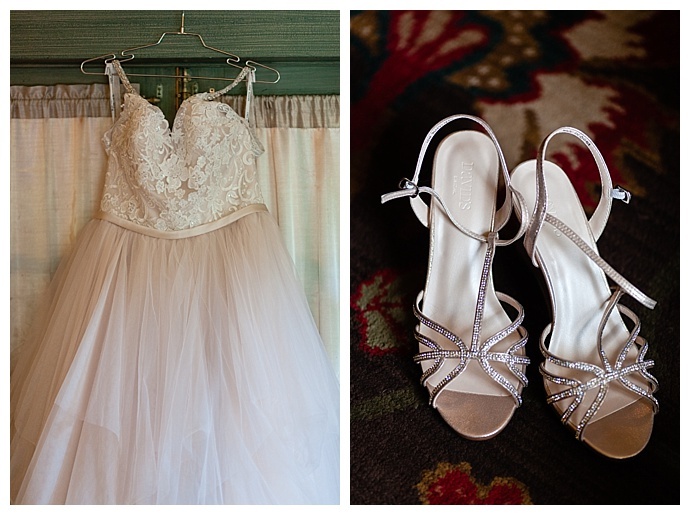 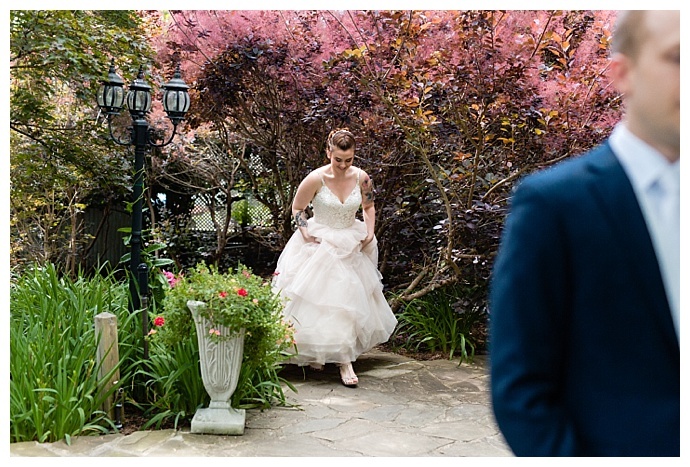 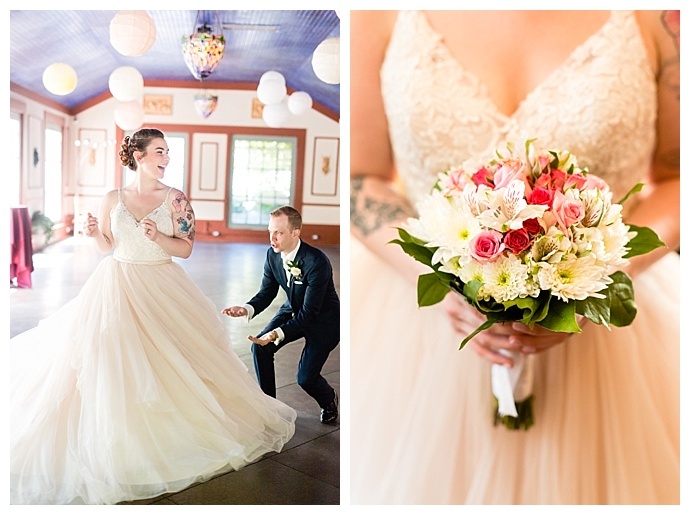 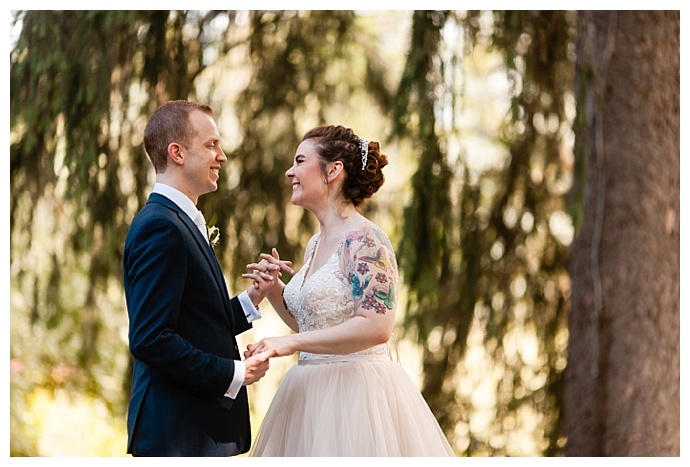 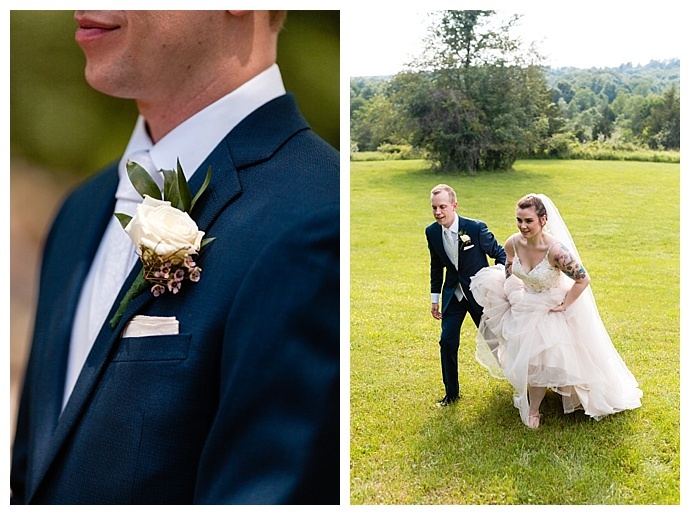 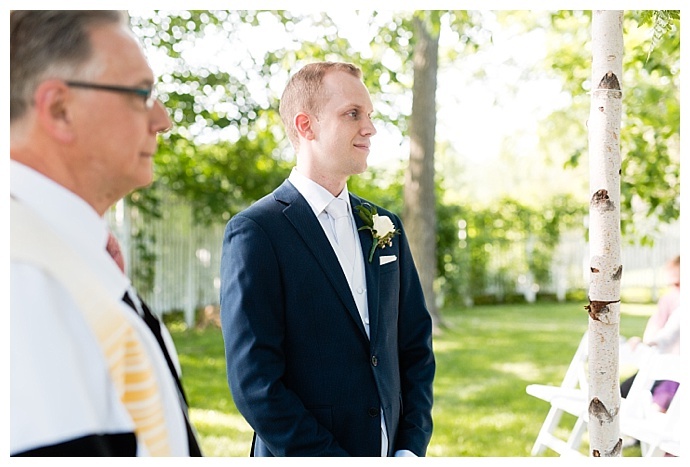 Susanna chose a blush wedding dress with a layered tulle skirt that she found at a Kleinfeld sample sale, and Jacob paired a Calvin Klein suit with a white vest and white tie for a polished look. 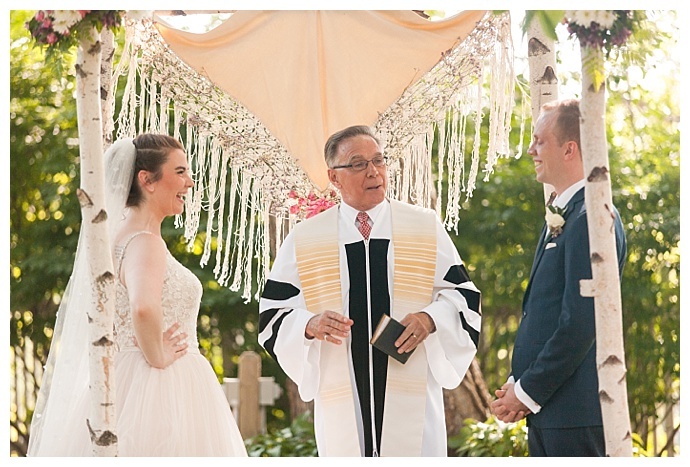 After they were pronounced husband and wife, Jacob kissed his bride and broke the glass! 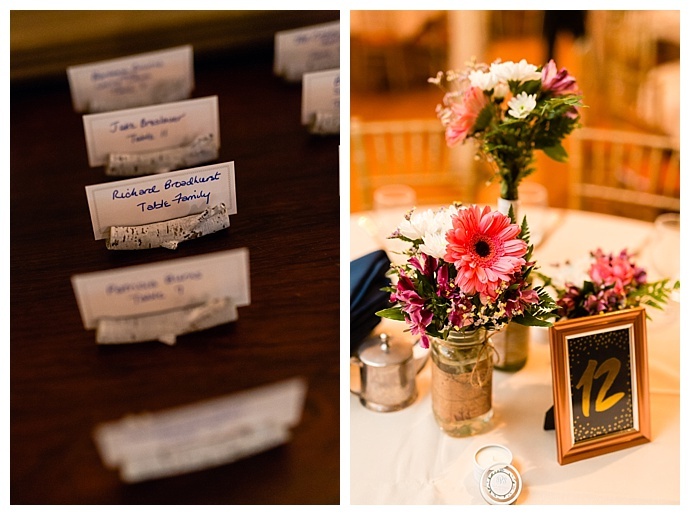 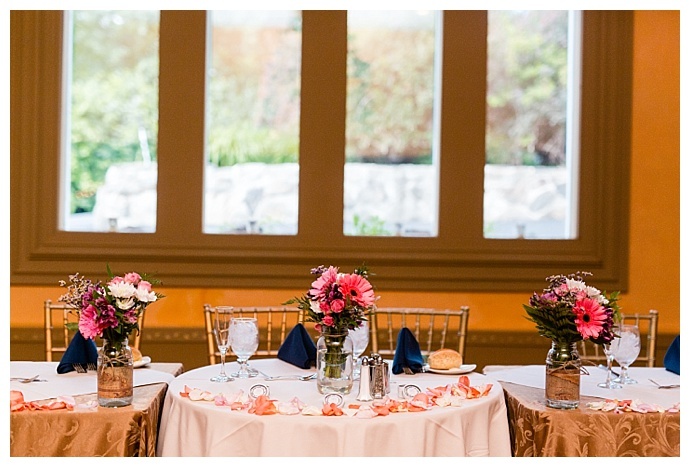 Susanna and Jacob incorporated vibrant wildflowers, mason jars, birch wood and travel-themed details into the reception decor. 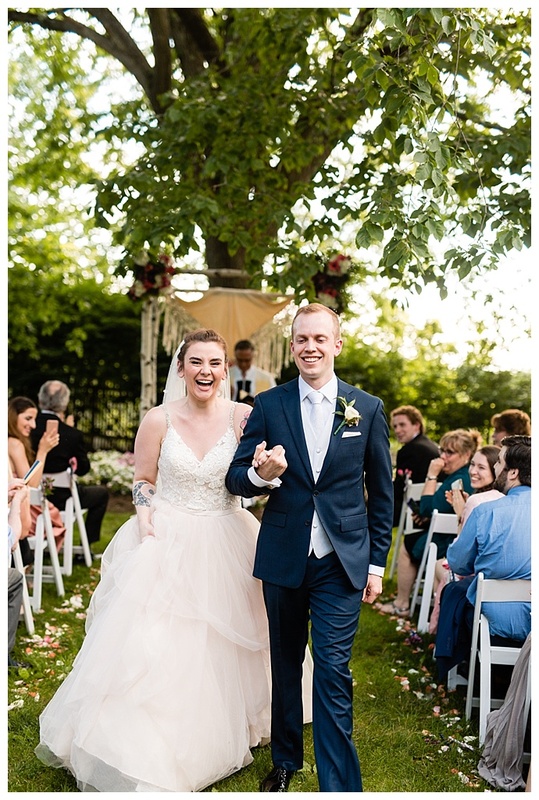 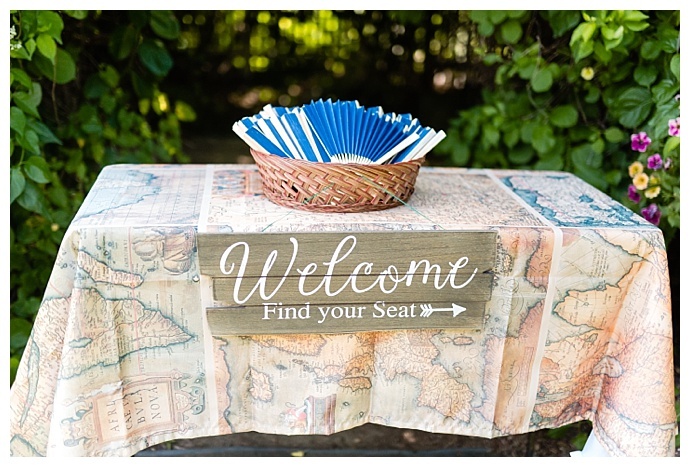 While planning their wedding, Susanna and Jacob felt good food and an open bar were of the utmost importance to provide their guests with an unforgettable experience. 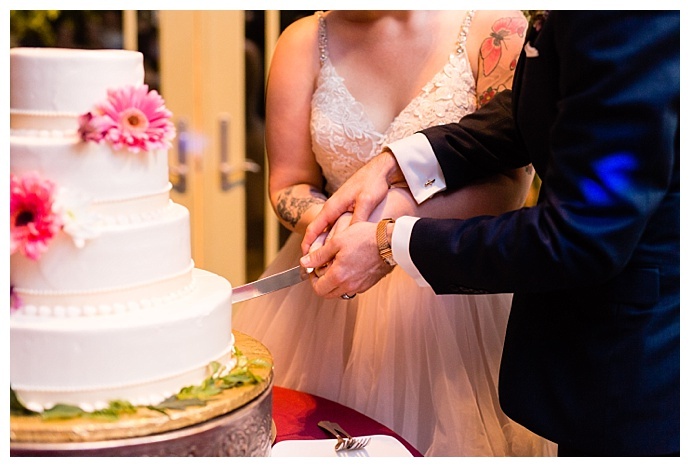 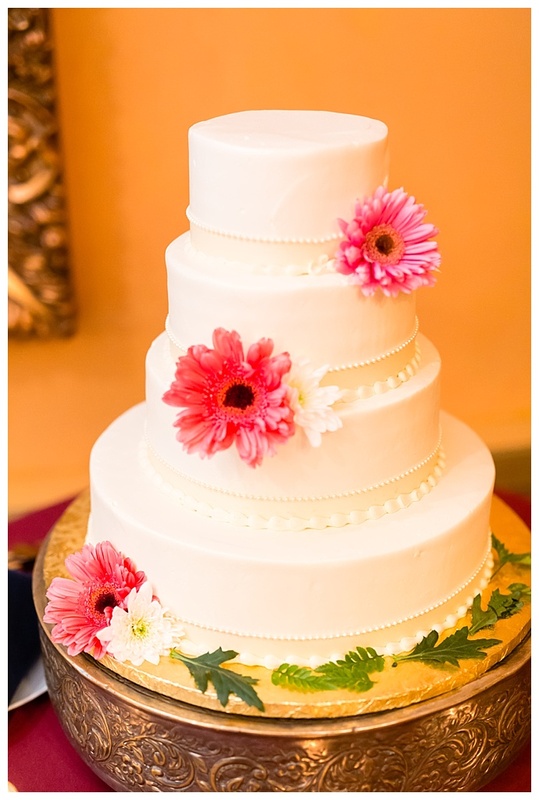 And in addition to their gorgeous four-tiered white wedding cake, which was decorated with pink gerber daisies, they had a delicious gelato bar for dessert. 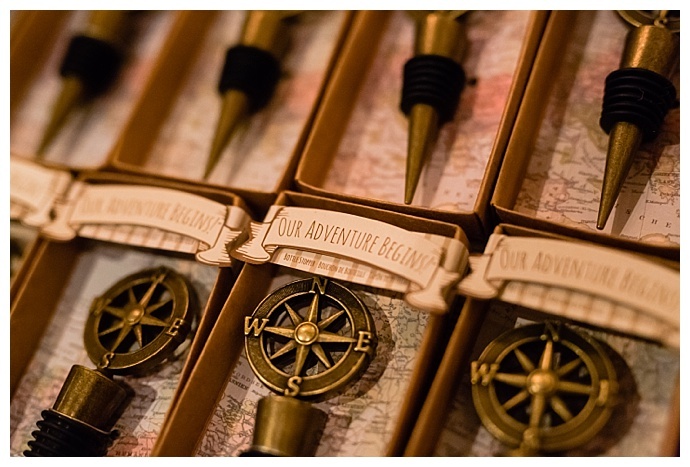 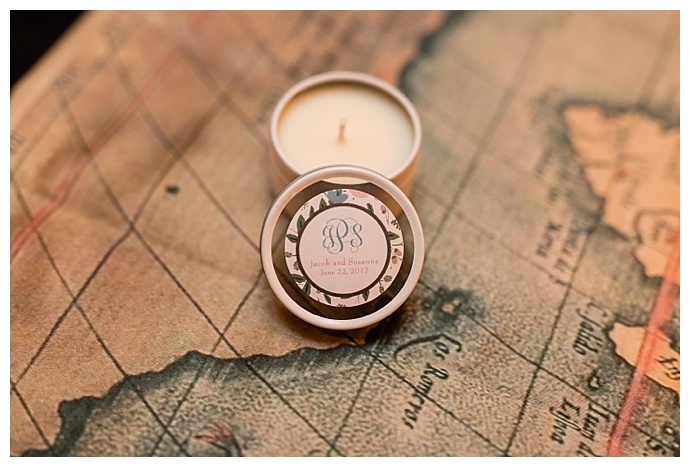 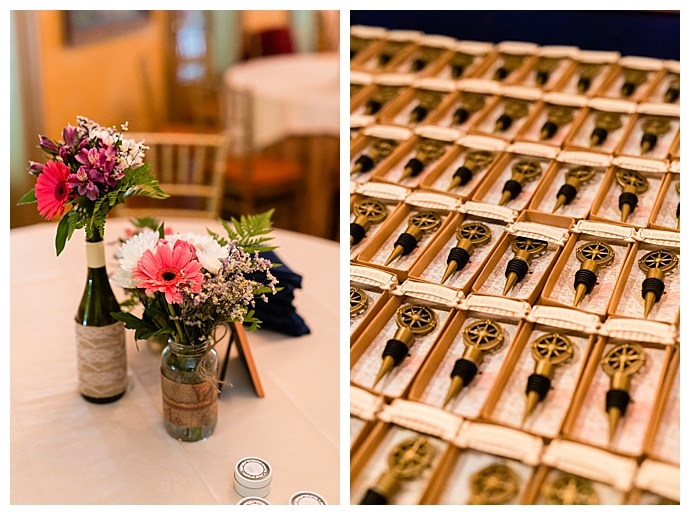 And as the night came to an end, they sent their guests home with compass wine stoppers and boxes of pecans. 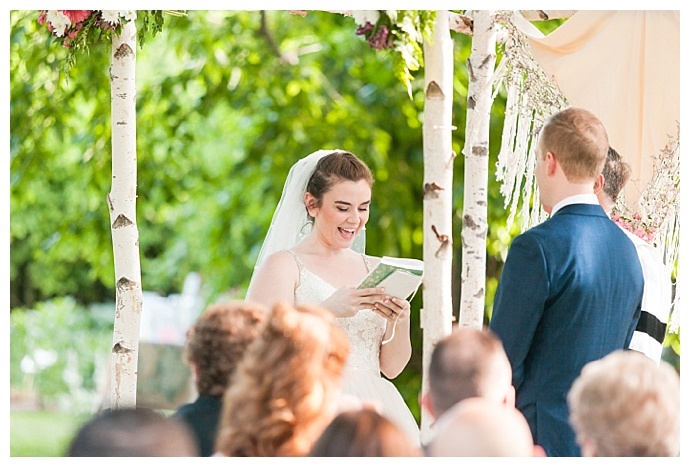 “The pecans were a family joke since we have always argued about how to pronounce pecan,” the bride and groom say.